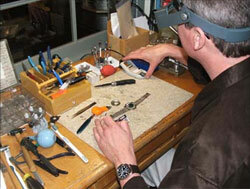 Mongillo Jewelers repairs all styles of watches from the least expensive to the most expensive. Mark Mongillo has been a certified watchmaker for XXXX years and is experienced in mechanical watch repair including Accutron, Bulova, Rolex to name a few. Whether its a simple battery change or hand making a part for a rare watch or a complete cleaning and overhaul, Mr. Mongillo can repair it.